October marked a very important milestone for my big girl who was going to graduate for the very first time. Remember when we were young and how we used to take pictures in mortarboards and graduation gowns? Everyone looked so super duper cute, right? Well, the thing is when you are a mum and it's your kid's turn to graduate, besides noticing how lovely and grown up she looks, there is also this intense surge of emotions and you feel proud, happy, excited, sentimental, affectionate, nostalgic and misty-eyed all at once. I remember this time last year, I felt for sure that I would weep when it was Angel's turn to graduate from K2. I mean, I already teared uncontrollably when I saw her seniors giving speeches and receiving their scrolls at that time, and I couldn't imagine how my heart would feel when it was our moment. On the morning of the big day, we woke up promptly at 6:30am and she managed to reach school on time at 7:00am after having a quick breakfast. Strangely, I was the one who was tossing and turning the whole night and somehow didn't really manage to catch a good sleep. 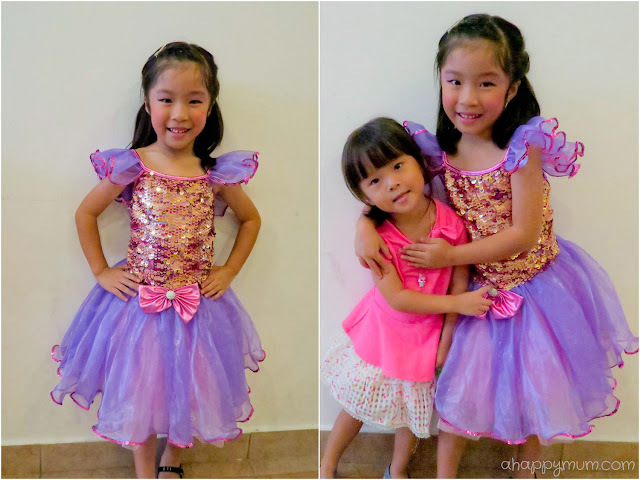 Since she would be doing her makeup, dressing up and travelling to the performance venue with her class, all I could do was to go home and anticipate for the big moment. Together with the little sister, the hubby and I arrived early at the venue hoping to get good seats. I was relieved that the hubby could make it this year as he was absent last year and I think it made a huge difference to our girl. Even though the doors were not yet opened, there was already a long queue of parents and siblings who were there to cheer for their dearest one on this day. Thankfully, families of K2 students were given priority and the first few rows were all reserved for us! So we managed to sit in the very first row and get a good view of the stage. Yay! When the show was about to begin, some of the K2 students started to peek out from the backstage and I smiled a big smile when I saw my girl all dressed in her gown and mortarboard. We waved, I gave her the thumbs-up and we sent each other flying kisses too. Awwww. After watching an introduction video and listening to what the graduating batch of students had to say to their peers and teachers, the first performance that they put up was a music performance where they would ring bells and sing to a Japanese folk song titled The Frog's Song. After that, we moved on to the graduation ceremony and the students were called upon one by one to receive their scrolls. I was so proud when it was her turn and relieved to see that she remembered to receive with both hands, give a bow and a big smile to the audience before taking her spot in the line. And you know what? Even though I was so touched and a little emotional at that point, I actually didn't tear at all and all I did was to smile at her and let her know what a happy mum I was that day. 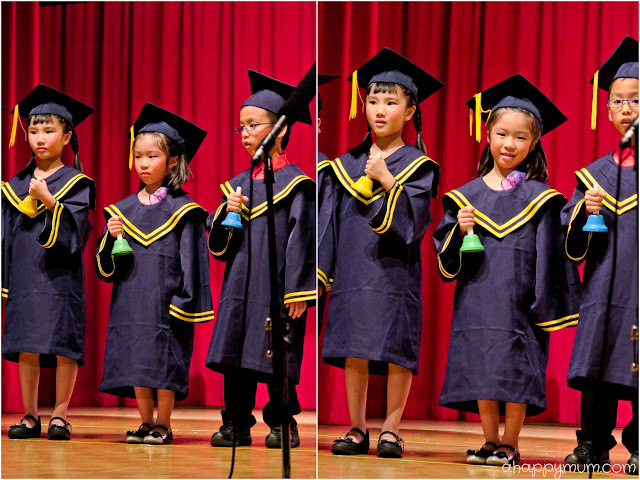 The final highlight for the K2 students was to perform a skit titled Lilo and Stitch. Angel was going to play as Mertle, one of Lilo and Stitch's friends in their dance class who was initially an arrogant girl who wanted to be the leader but eventually realised the importance of humility. She didn't forget her lines or any of the hand gestures but did everything with confidence. Phew! After seeing how she did at the music performance, we were all a little worried that she might forget her lines or even break down on stage if she make a mistake again. I was keeping my fingers and toes crossed that she would keep her cool and just do her best like what she always did when we rehearsed at home. And guess what? She did an awesome job of it all, even though her lines were not that many. She acted like a proud girl when she had to, stomped her feet and stared when it was her turn, and became a humble girl who made friends with everyone at the end. She did not forget a single word but instead delivered all her lines with poise and confidence. That's the way, my dear! I wanted to run up to tell her that she did a great job and that I was so proud of her. And yes, that was what I did right after the show! I still find it amazing that I could experience so many different emotions in one short morning but was glad to know that everything went well and this first graduation concert of hers will surely leave behind lasting memories in my motherhood journey. The little one amused many people in the audience by how she just couldn't stop dancing! Anyway, how can we miss out all the fun dancing in a concert, right? So, we sat back and enjoyed all the dance performances put up by the other classes. Wait, I mean the hubby and I sat back while the little one decided she wanted to join in the action and whenever the music turned on, she would jump down from her seat and start dancing too. 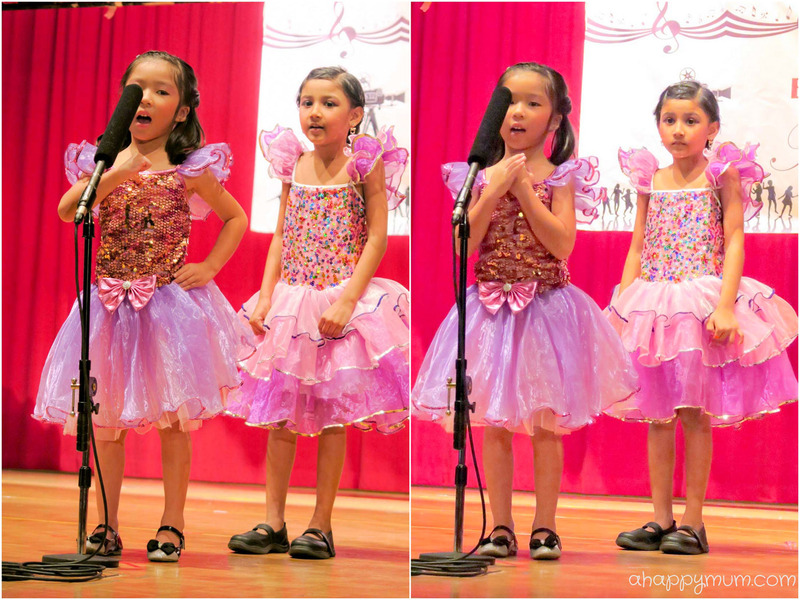 I bet she can't wait to perform in her first concert next time! Of course, the K2 class also put up a dance performance and for their finale this year, they danced to Glee's Light Up The World which was a really catchy and fun song! I knew that my girl tried her very best even though her light dropped at the end and she fumbled a little with the ending pose. Here's a short clip showing the highlights of the day and even though it was quite dim and hard to capture a good video with my camera, I am definitely going to cherish this for as long as I can and I bet we will be reminiscing and talking about it even when she is all grown up. Here's a big thank you to her teachers and everyone who made this concert possible. We really appreciate all the efforts put in and are thankful that we get to celebrate this important milestone with our child before she moves on to primary school. 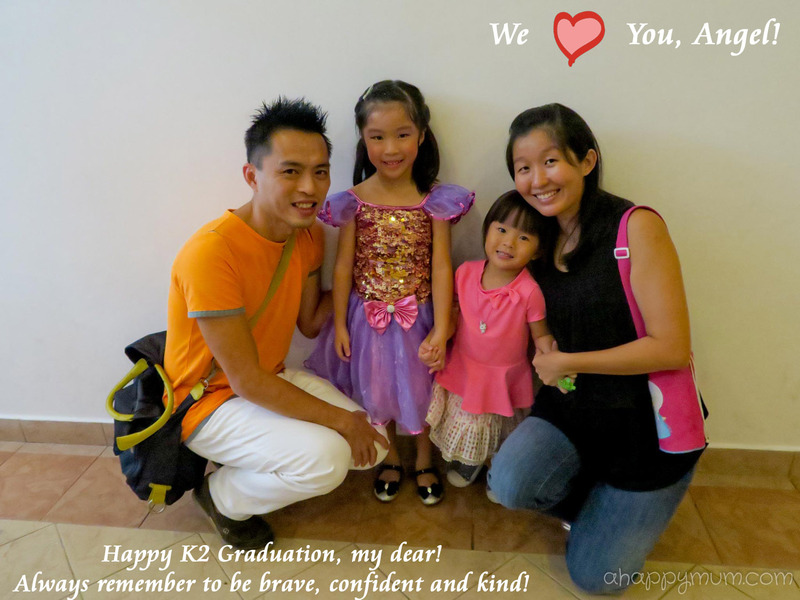 Congratulations on your K2 graduation! I still remember the first day you went to school, how you were overwhelmed by everything, how you refused to let go of my hand and how you would sit on my lap to listen to what your teacher was saying. I couldn't bear to leave you for too long and so for the first two years, you only attended school for three hours every day and would spend every of your afternoon hanging out with me and your little sister. When it was time for Kindergarten 2, the teacher advised that you spend the afternoon in school so that you can learn Chinese and have a better foundation for primary school. I let you make the choice and even though I was a little sad when you said you wanted to spend more time with your friends in school, I respected your decision but would try to pick you up as early as I could every day. Yes, you were always one of the latest to reach and earliest to go off, you know that? Time flies and today was your graduation concert. I can't even describe to you how beautiful you looked today and how proud I was of you, my dear princess. When I saw you in your graduation gown and mortarboard, I was reminded of how you will always be my eldest child and how you will be the first to go through many important milestones in life. Whatever happens, I am just glad that I will be with you every step of the way to celebrate with you, to cheer you on and to cherish these precious moments together. If there is one thing I think you need to learn, it's that you must be brave, confident and know that you are stronger than you think. Life will not always be a bed of roses and when life gets us down, we have to overcome our hurdles and continue to believe that we can achieve even the impossible. It is okay to be afraid and feel sad, even Mummy does that too, but we should never let negativity dominate us but instead, we have to learn to deal with it, strive on and remain positive. Life is beautiful and always full of hope, I hope you will bear that in mind even when you grow up. Oh, and don't forget to smile, because you have the most angelic smile I know and you have no idea how much joy a smile can bring to the world. Mummy loves you so much, always and forever, my dear. Looking forward to celebrating more milestones with you and thank you for being a great big sister, an awesome daughter and a shining gem in my world. I feel the same way as you do! :) How time flies! Child graduation has dual sense for parents. Because From the one side the parents are happy from the other side the parents are upset because of their children are grown fast. Nevertheless children need parents help in any age. That is why the parents can read essayontime review and advise their children to use the best service. Which helps with home assignments.